Are You Winning Every Hand You Should Be? Click For Larger View of Picture! Mistakes at your Casino are occurring daily that could be costing thousands of dollars in lost winnings. 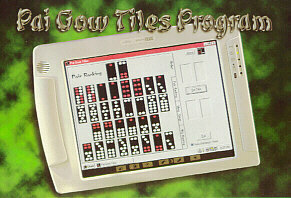 The Pai Gow Tiles Program ( ) was designed to protect against those errors. Pai Gow is a difficult game to learn. Proper tile placement and understanding the complicated house rules and exceptions is hard even for the highly trained. With the , in the amount of time it takes for someone to touch four tiles (usually less then 3 seconds) the correct tile placement occurs. The program's visual design was created so that, with a few minutes of training, anyone can lay tiles correctly! If my 4 year old daughter can do it, you can too! But dont be fooled by its simplicity, the program analyzes over 55,000 combinations to come up with the correct placement, every time! WebSite Copyright © 2011 by C&C Computer Designs L.L.C. All rights reserved. Revised: 27 Feb 2015 08:27:36 -0700.